Washington, DC - This year's annual U.S. Botanic Garden (USBG) holiday exhibit, Season's Greenings: Roadside Attractions, will open Thanksgiving Day, November 23, 2017 and run through January 1, 2018. The USBG is vibrant throughout the holidays with the sights, scents, and sounds of the season. Wreaths, garland, trees, and thousands of blooms from exotic orchids to a showcase of heirloom and newly developed poinsettia varieties adorn the Conservatory. 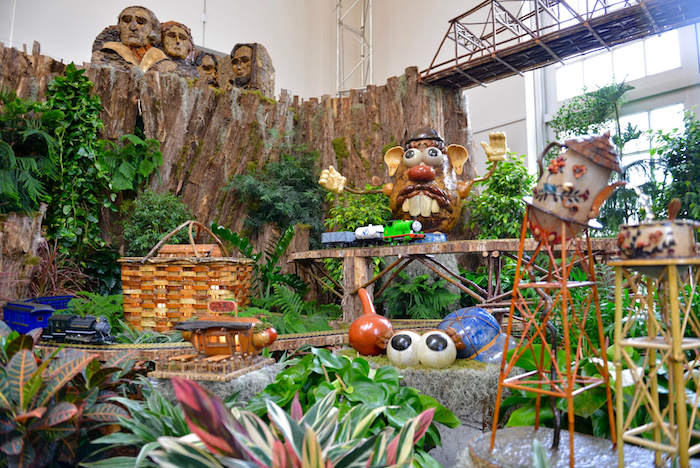 This year, take a trip across America as our annual holiday show features roadside attractions! In our gallery, model trains will chug around, below, through, and above plant-based recreations of iconic sights from across the United States. Explore classic attractions like Texas' Cadillac Ranch, Colorado's hot-dog-shaped Coney Island Hot Dog Stand, South Dakota's Corn Palace, New Jersey's Lucy the Elephant, and many more representing 40 different roadside attractions, all made from plants and other natural materials. In the Garden Court, find model landmarks from our nation's capital - all made from plant materials. On display are 12 D.C. landmarks including the U.S. Capitol, the Washington Monument, the Lincoln Memorial, with a new addition this year, an inspired botanical version of the National Museum of African American History and Culture. A showcase of more than 30 varieties of poinsettias will feature heirlooms, classics, and multiple newly developed varieties. Media Preview: Tuesday, Nov. 21, 2017, 11:00 a.m. - 12:30 p.m. Email to RSVP.